As the athletics world prepares to descend upon Berlin for the 12th IAAF World Championships in Athletics (15-23 Aug) it’s appropriate to take a quick overview of the German capital’s rich athletics history in which some of the sports greatest legends were made, and numerous significant barriers broken. Much of the city’s sporting lore revolves around the 1936 Olympic Games which gave the world the legend that is Jesse Owens. Over the years, much has been written about the American who left Berlin that summer with four gold medals, a feat which would go unmatched for an astounding 48 years. In addition to his solo victories in the 100m, 200m and Long Jump at the Olympic Stadium, Owens also teamed with Ralph Metcalfe, Foy Draper and Frank Wykoff in the 4x100m Relay to break through the event’s 40-second barrier. So remarkable was their 39.8 World record that it would stand for two decades until another U.S. quartet clocked 39.5 at the 1956 Olympics in Melbourne. 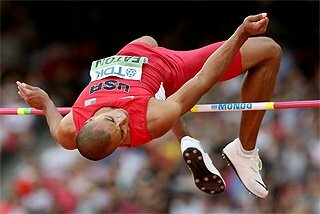 There were other barriers broken during those Olympic Games and other World records set. Japan's Naoto Tajima landed at exactly 16.00m to take Olympic gold, a record which stood for 15 years. New Zealander Jack Lovelock took Olympic 1500m gold with a 3:47.8 World record. And in the 3000m Steeplechase, Volmari Iso-Hollo of Finland retained his Olympic title and in the process lowered the global best to 9:03.8 in a race where silver and bronze medallists Kaarlo Tuominen (9:06.8) of Finland and German Alfred Dompert (9:07.2) also dipped under the previous mark. But there is more to the story beyond the historical achievements in 1936. Owens wasn’t the first American to bring speed to the German capital, nor was he the last. In August 1929, Eddie Tolan equalled his own 10.4 World record, and at the 1956 World Military Championships, Americans Willie Williams and Ira Murchison became the first to clock 10.1 in the 100m. Nearly 20 years later in 1975, Steve Williams equaled the 9.9 record he shared at the time. An earlier barrier also fell in the men’s 4x100 when the German quartet of Arthur Jonath, Richard Corts, Hubert Houben and Helmut Kornig dipped under 41 seconds for the first time with their 40.8 at a match against France on 2 September 1929. In the women’s 100m, East German Renata Stecher Meissner twice clocked 11.0 in Berlin to equal the World record, first in 1971 and then again in 1972. A decade later, another East German, Marlies Gohr, broke her own record with a 10.81 dash at the 1983 Olympic Day Meeting. 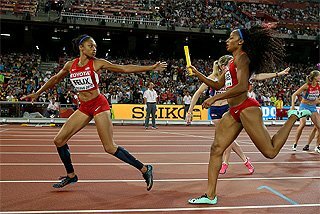 Berlin also witnessed several records in the women’s 4x100. The German quartet of Emmy Albus, Kathe Krauss, Marie Dollinger and Ilse Dorffeldt clocked 46.4 in the heats of the 1936 Games. Heavy favourites for the gold, misfortune hit when Dorffeldt dropped the baton on the last changeover in the final. The mark was revised again in 1974, nearly four decades later, to 42.6 by East Germans Doris Maletzki, Renate Stecher, Christina Heinrich and Barbel Eckert. It fell again twice more in the 1980s: first to Romy Schneider/Muller, Eckert/Wockel, Ingrid Auserswald and Gohr when they clocked 42.09 at an Olympic test event on 9 July 1980 and again three years later at a World championships test, this time by the quartet of Silke Gladisch, Marita Koch, Ingrid Auerswald and Gohr, who clocked 41.53. A full decade before Lovelock’s run at the Olympics, at the end of the 1926 season Germany's Dr. Otto Peltzner lowered the 1500m World record to 3:51.0 in an epic battle with Finland’s Paavo Nurmi. More than half a century later, legendary Moroccan Said Aouita broke a later World record mark, which had stood for just five weeks, with his sterling 3:29.46 run at the 1985 ISTAF meeting. It would stand for more than seven years. Moving up slightly in distance, Aouita’s Moroccan successor Hicham El Guerrouj clocked 4:44.79 for 2000m in 1999, a record which still stands. But these two modern day giants were preceded by another. The deeds of the aforementioned Paavo Nurmi and those of about a dozen of his compatriots in the middle and long distance running leading the world to coin the term, ‘the Flying Finns’. Four months before his World record 1500m battle with Peltzner in September 1926, Nurmi set his second 3000m World record in Berlin, clocking 8:24.5 in late May. The ‘Phantom Finn’, returned two years later - the year in which he claimed his ninth Olympic gold - to claim two more World standards, 19,210m in the One Hour Run, and a 50:15.0 mark for 10 Miles en route. More recently, Berlin has become synonymous with fast marathons. Brazil's Ronaldo da Costa knocked 45 seconds from the World record with his 2:06:05 at the 25th Berlin Marathon in 1998, knocking on the door of sub-2:06. Paul Tergat smashed through the 2:05 barrier with his 2:04:55 in the 2003 race, before Haile Gebrselassie did away with the 2:04 barrier in the 2008 race, clocking 2:03:59. On the women’s side, Kenyan Tegla Loroupe broke her own record at the 1999 Berlin Marathon, clocking 2:20:43. Two years later it was Japan’s Naoko Takahashi’s turn to take the spotlight after her 2:19:46 victory, becoming the first woman to crack 2:20. 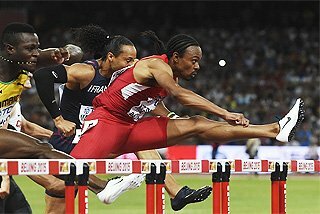 In the hurdles, the first significant mark in Berlin came at the 1936 Games when American Forrest Towns equalled his own 14.1 record in the semi-finals before striking gold. 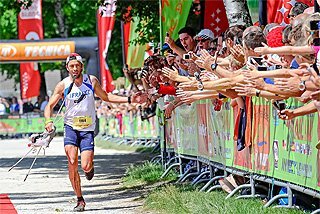 One of the last came in 1975 when Frenchman Guy Drut clocked 13.0, the last official hand-timed World record. For the women, Trebisonda Valla of Italy 11.6 equaled the 80m Hurdles World record in the 1936 Olympic semi-finals and a year later, Briton Barbara Burke equalled it again in the same stadium at the ISTAF. The mark underwent revision again in 1960 when East German Gisela Birkemeyer clocked 10.6. After the event’s switch to 100m, East German Kaarin Balzer began her record-setting rampage. On 5 September 1969, she became the first to dip under 13 seconds with 12.9. She followed up with two 12.7 record performances in Berlin, in 1970 and 1971, and yet again to 12.6, also in 1971. Over the full lap, Sabine Busch of East Germany produced a 53.55 World record in 1985 running in pouring rain. East German Rosemarie Witschas, who was later better known as Ackermann, entered the record ranks for the first time in Berlin when she equaled the 1.94 mark in August 1974 at the age of 22. At the ISTAF meet three years later, she not only equalled her own 1.97m with her first try, she went on to become the first woman to top 2.00m, also with her first attempt. A decade later, Bulgarian Lyudmila Andonova left her mark in Berlin when she cleared 2.07m, adding two centimetres to the previous mark. A significant barrier was crossed in the women’s Long Jump as well with German Christel Schultz's 6.12m leap at the ISTAF in 1939, the first six-metre leap. Berlin played host again in 1961 when East German Hildrun Claus reached 6.42m. Later, Heike Drechsler set the first of her three World records in Berlin, jumping 7.44m in 1985. On the men’s side, high jumper Carlo Thranhardt of West Germany leaped 2.42m indoors in 1988, while East German Wolfgang Nordwig scaled 5.45m in the Pole Vault at the Olympic Day meet in June 1970, his first of two World records that summer. And later still current IAAF Senior Vice-President Sergey Bubka vaulted to an indoor mark of 6.13m in February 1992. Berlin has also been friendly to throwers. East German Margitta Gummel reached 20.10m in the Shot Put in 1969 and six years later, Marianne Adam broke the record twice at the East German Club Cup championships, putting 21.58m and 21.60m. On the men’s side, East German Ulf Timmermann extended the record to 22.62m in September 1985, only to see it reclaimed by his compatriot Udo Beyer the following year at the same Dynamo Sportforum venue with a 22.64m toss. Records in the women’s Discus Throw date back to the 1936 German national championships at Olympic Stadium, when Gisela Mauermayer threw 48.31m. Another record was set in 1969 by West German Lisel Westermann whose 62.70m was the second of her three world marks. In the men’s Discus, Wolfgang Schmidt of East Germany threw 71.61m in 1978, the first effort beyond 71 metres. But the biggest barrier to fall was the 100 metre line in the Javelin Throw when East German Uwe Hohn reached 104.80m on 20 July 1984, ceiling any doubts that a change in the implement’s design which was already underway was distinctly necessary. Berlin also witnessed several world marks in the Javelin Throw set during the era of the International Women's Federation (FSFI), but the first during the modern era came in 1976 when East German Ruth Fuchs threw the fourth of her six World records, reaching 69.12m. 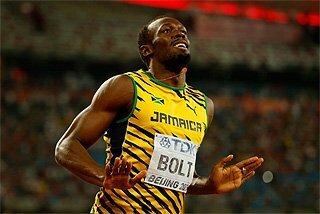 PLEASE NOTE: this article offers a general overview of Berlin's athletics past, providing a concise historical backdrop to the events of the 12th IAAF World Championships in Athletics, Berlin, Germany (15-23 August 2009), and is not designed to be a comprehensive history. 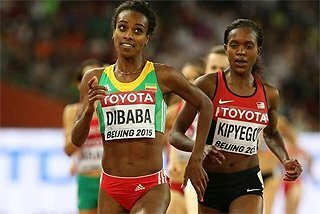 Tandis que la grande famille de l'athlétisme s'apprête à se rendre à Berlin pour les 12èmes Championnats du Monde d'Athlétisme de l'IAAF (15-23 août) il est approprié que nous nous penchions sur la riche tradition athlétique dont peut s'enorgueillir la capitale allemande, où quelques-unes des plus grandes légendes sportives se sont forgées et de nombreux records significatifs ont été établis. Les plus connus parmi les nombreux exploits d'anthologie que l'on associe à la capitale allemande sont sans doute ceux accomplis par Jesse Owens lors des Jeux Olympiques de 1936. L'Américain avait quitté Berlin cet été-là auréolé de quatre titres olympiques, une performance qui ne serait pas égalée avant 48 ans! En plus de ses victoires individuelles dans le 100m, le 200m et le saut en longueur, Owens a fait équipe dans le Stade olympique avec Ralph Metcalfe, Foy Draper et Frank Wykoff pour remporter le relais 4x100m dans un temps inférieur à 40 secondes. Leur record du monde de 39"8 n'a pas été battu avant vingt ans, lorsqu'une autre équipe américaine a remporté le titre olympique des Jeux de Melbourne en 1956 en 39"5. Les Jeux de Berlin ont été la scène de nombreux autres exploits. Le Japonais Naoto Tajima a pris l'or dans le Triple saut avec 16 mètres tout juste, un record qui a tenu quinze ans. Le Néo-Zélandais Jack Lovelock a gagné le 1500m masculin avec un record du monde de 3'47"8 à la clé. Dans le 3000m Steeple, le Finlandais Volmari Iso-Hollo a défendu avec succès son titre olympique, également avec un nouveau record du monde de la discipline de 9'03"8, dans une course où tant le médaillé d'argent, le Finlandais Kaarlo Tuominen (9'06"8) que le médaillé de bronze, l'Allemand Alfred Dompert (9'07"2), ont battu le record du monde précédent. Owens n'a été ni le premier coureur américain à éblouir la capitale allemande avec sa vitesse ni le dernier. En août 1929, Eddie Tolan a égalé son propre record du monde de 10"4, et lors des Championnats du Monde Militaires de 1956, les Américains Willie Williams et Ira Murchison ont été les premiers à enregistrer 10"1 dans un même 100m. Près de vingt ans plus tard, en 1975, Steve Williams a égalé le record du monde de l'époque de 9"9, qu'il partageait à l'époque. La barrière des 41 secondes au 4x100m masculin avait été franchie par le quatuor allemand composé d'Arthur Jonath, Richard Corts, Hubert Houben et Helmut Kornig lorsqu'ils ont réussi 40"8 lors d'une rencontre opposant l'Allemagne à la France, le 2 septembre 1929. Du côté des femmes, l'Allemande de l'Est Renata Stecher Meissner a réussi onze secondes deux fois à Berlin, égalant ainsi le record du monde du 100m, d'abord en 1971 puis à nouveau en 1972. Une décennie plus tard, c'était au tour de sa compatriote, Marlies Göhr, de s'illustrer sur la piste berlinoise lorsqu'elle a battu son propre record du monde avec un temps de 10"81 lors de la compétition de la Journée olympique de 1983. 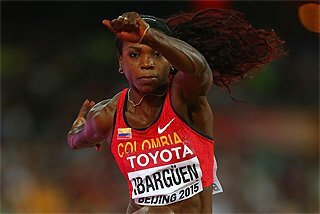 Berlin a également vu plusieurs records établis dans le 4x100m femmes. La sélection allemande, composée d'Emmy Albus, Kathe Krauss, Marie Dollinger et Ilse Dorffeldt, a réussi 46"4 lors des qualifications des Jeux de 1936. Grandes favorites pour le titre, elles ont joué de malchance lorsque Dorffeldt a laissé échapper le témoin dans le dernier relais. 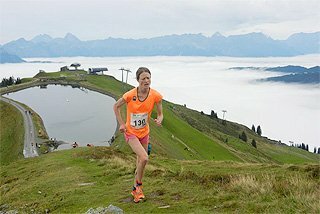 Près de quarante ans plus tard, ce record est passé à 42"6, un temps réussi par les Allemandes de l'Est Doris Maletzki, Renate Stecher, Christina Heinrich et Bärbel Eckert. Ce record devait être amélioré à deux reprises encore au cours des années 80, toujours par des sélections est-allemandes: d'abord par Romy Schneider (Muller), Bärbel Eckert (Wöckel), Ingrid Auerswald et Marlies Göhr, qui ont couru un temps de 42"09 lors d'un test pré-olympique le 9 juillet 1980, puis trois ans plus tard, peu avant les Championnats du Monde, lorsque l'équipe composée de Silke Gladisch, Marita Koch, Ingrid Auerswald et Marlies Göhr, a enregistré 41"53. Pour les figures de légende de la course de fond, toutes les routes mènent à (et traversent) Berlin! Dix ans avant la victoire de Lovelock dans le 1500m des Jeux Olympiques de Berlin, à la fin de la saison 1926, le docteur Otto Peltzner, qui représentait l'Allemagne, a abaissé le record du monde du 1500m à 3'51" au terme d'un duel épique livré contre le Finlandais Paavo Nurmi. Plus d'un demi-siècle plus tard, le légendaire Marocain Said Aouita a lui aussi battu le record du monde de la spécialité, après que le précédent ait été établi à peine cinq semaines plus tôt, son temps de 3'29"46 venant couronner une superbe course dans le cadre du Meeting ISTAF de 1985. Ce record ne serait pas battu avant sept ans. Dans une distance légèrement supérieure, le 2000m, c'est "l'héritier" marocain d'Aouita, Hicham El Guerrouj, qui a établi un record du monde à Berlin, son temps de 4'44"79 étant toujours en place aujourd'hui. Ces deux géants du demi-fond et du fond avaient été précédés à Berlin par de nombreux autres spécialistes de ces disciplines, dont le mythique Paavo Nurmi, et une douzaine de ses compatriotes, à qui on a donné le nom collectif de "Finlandais volants". Quatre mois avant sa course contre Peltzner sur 1500m en septembre 1926 qui allait déboucher sur le record du monde pour ce dernier, Nurmi avait couru son second record du monde sur 3000m à Berlin avec un temps de 8'24"5 à la fin du mois de mai. Le "Fantôme finlandais", comme le surnommait la presse, est revenu deux ans plus tard, la même année au cours de laquelle il a remporté sa neuvième médaille d'or olympique, pour établir deux nouvelles meilleures performances mondiales: 19 210m parcourus en une heure, et, dans la même épreuve, un temps de 50'15 pour 10 Miles. 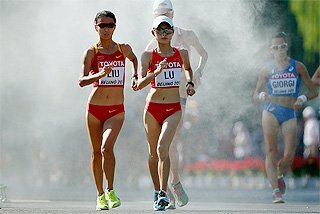 Plus récemment, Berlin est devenu synonyme de marathons rapides. Le Brésilien Ronaldo da Costa a abaissé de 45 secondes le record du monde avec un temps de 2h06'05 réussi lors du 25ème Marathon de Berlin en 1998, laissant augurer un temps sous les 2h06. 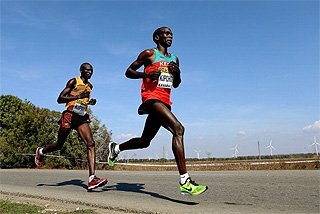 Paul Tergat est descendu sous les 2h05 lorsqu'il a couru 2h04'55 en 2003, avant qu' Haile Gebrselassie ne fasse tomber la barrière des 2h04 en 2008, avec un chrono de 2h03'59. Chez les femmes, la Kenyane Tegla Loroupe a battu son propre record du monde lors du Marathon de Berlin de 1999, avec 2h20'43. Deux ans plus tard c'était au tour de la Japonaise Naoko Takahashi de faire les gros titres des journaux lorsqu'elle est devenue la première marathonienne à descendre sous les 2h20' avec un triomphal 2h19'46. Dans les courses de haies, le premier temps significatif enregistré à Berlin remonte aux Jeux de 1936 lorsque l'Américain Forrest Towns a égalé son propre record du monde de 14"1 en demi-finale avant de remporter la médaille d'or le lendemain. On peut aussi relever les 13 secondes courus par le Français Guy Drut, le dernier record du monde manuel officiel. Chez les femmes, l'Italienne Trebisonda Valla a égalé le record du monde du 80m haies en 11"6 lors des demi-finales olympiques en 1936, et, un an plus tard, sur la piste berlinoise, c'est la Britannique Barbara Burke qui l'a égalé une fois encore, lors du Meeting de l'ISTAF. En 1960 l'Allemande de l'Est Gisela Birkemeyer a réussi un nouveau record du monde avec 10"6. Après que la distance soit passée à 100m, l'Allemande de l'Est Karin Balzer a entamé sa série extraordinaire de records de la discipline: le 5 septembre 1969, elle est devenue la première femme à descendre sous les treize secondes avec un temps de 12"9. Elle a ensuite réussi, toujours à Berlin, deux nouvelles performances de records du monde de 12"7, en 1970 et 1971, puis, également en 1971, de 12"6. Dans le 400m haies, l'Allemande de l'Est Sabine Busch a couru 53"55, un record du monde, en 1985 sous une pluie battante. L'Allemande de l'Est Rosemarie Witschas, qui serait par la suite plus connue sous le nom d'Ackermann, a inscrit son nom sur les tablettes mondiales du saut en hauteur pour la première fois à Berlin lorsqu'elle a égalé 1,94m en août 1974, âgée de tout juste 22 ans. Lors du Meeting de l'ISTAF trois ans plus tard, elle a non seulement égalé son propre record du monde de 1,97m dès son premier essai, mais est ensuite devenue la première sauteuse de l'histoire à franchir deux mètres, également à son premier essai. Une décennie plus tard, la Bulgare Lyudmila Andonova a franchi 2,07m à Berlin, améliorant de deux centimètres le record du monde précédent. Une étape importante a été atteinte dans le saut en longueur féminin à Berlin lorsque l'Allemande Christel Schultz a réussi 6,12m lors du Meeting ISTAF en 1939, la première fois que les six mètres étaient dépassés. En 1961 c'était au tour de l'Allemande de l'Est Hildrun Claus de rééditer la performance, avec un bond de 6,42m. En 1985 Heike Drechsler a établi le premier de ses trois records du monde à Berlin, avec un saut de 7,44m. Chez les hommes, le sauteur en hauteur allemand Carlo Thranhardt a franchi 2,42m en salle en 1988, tandis que l'Allemand de l'Est Wolfgang Nordwig a réussi 5,45m à la perche lors de la Journée olympique de juin 1970, le premier de ses deux records du monde cet été-là. Plus tard encore, toujours à la perche, Sergey Bubka, l'actuel vice-président senior de l'IAAF, a réussi le record du monde en salle avec 6,13m, en février 1992. Berlin a aussi bien réussi aux lanceurs au fil des années. L'Allemande de l'Est Margitta Gummel a atteint 20,10m au lancer de poids en 1969 et six ans plus tard Marianne Adam a battu le record du monde deux fois lors de la Coupe des championnats nationaux est-allemands, avec des distances de 21,58m et de 21,60m. Du côté masculin, l'Allemand de l'Est Ulf Timmermann a établi le record du monde du poids de 22,62m en septembre 1985, un record qui a été battu l'année suivante par son compatriote Udo Beyer, dans le même Dynamo Sportforum, avec une distance de 22,64m. Le premier record du monde du lancer de disque féminin enregistré à Berlin remonte aux Championnats allemands de 1936, lorsque Gisela Mauermayer a lancé 48,31m. Un autre record a été établi en 1969 par l'Allemande Lisel Westermann, dont le lancer de 62,70m était le second des trois records qu'elle a établis au cours de sa carrière. Chez les hommes, l'Allemand de l'Est Wolfgang Schmidt a réussi 71,61m dans le disque en 1978, la première fois que les 71 mètres étaient dépassés. La plus grande barrière à tomber fut toutefois celle des cent mètres dans le lancer de javelot, lorsque l'Allemand de l'Est Uwe Hohn a enregistré 104,80m le 20 juillet 1984, confirmant une fois pour toutes qu'une modification des spécifications de l'engin était devenue indispensable. 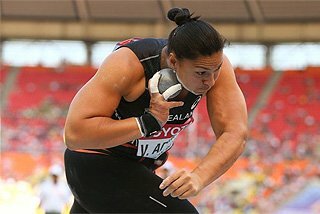 Plusieurs meilleures performances mondiales dans le lancer de javelot ont été réussies alors que le sport des femmes était encore sous l'égide de la Fédération Sportive Féminine Internationale (FSFI), mais la première enregistrée dans l'ère moderne est arrivée en 1976 lorsque l'Allemande de l'Est Ruth Fuchs a lancé le quatrième de ses six records du monde, avec 69,12m. 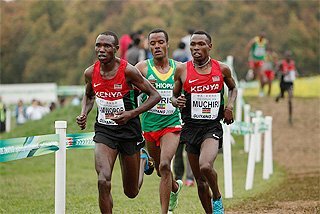 NB: cet article présente une vue d'ensemble de l'historique de l'athlétisme berlinois, et fournit une toile de fond concise en vue des 12èmes Championnats du Monde d'Athlétisme de l'IAAF de Berlin en Allemagne (15-23 août 2009). Il ne doit pas pour autant être considéré comme un historique complet.